Maybe you have a future rocket scientist on your hands? Good for him. 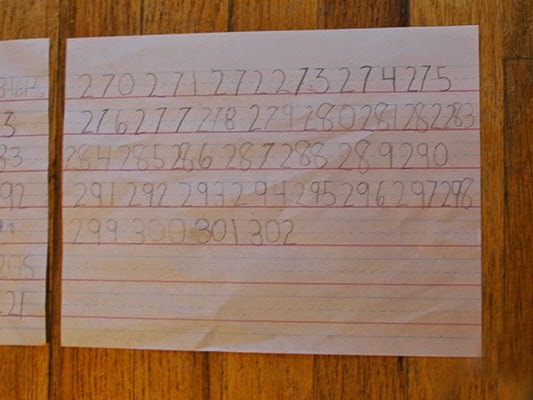 Did you ever see the movie "Knowing" where the kid was constantly writing down numbers and they turned out to be code from evil aliens? Looks like you have a budding mathematician. He has really neat handwriting! Oh wow you have a budding mathematician on your hands. Happy Friday!! Gotta love a kid that loves numbers! Wow, he has a terrific handwriting too. My son was fascinated with numbers and statistics. Now he is studying to be an accountant. I count in my head a lot too. Not because I am fascinated with numbers though. I really don't know why I do it. He writes numbers way neater than anyone I know!! Nice job! I am horribe at numbers and don't even like to think about them. My Hubs is great with them so when I need to add something that is beyond me.... I let him do it.